Every year, I go to the beach with a passel of girlfriends to celebrate friendship, talk about quilting (for fun and profit), and decompress. This year, I came directly here from the Mid-Atlantic Quilt Festival in Hampton, Virginia, driving my orange quilt truck filled to the top with sewing machines, fabric, supplies, and Kathy Lincoln, my partner in crime. Today, I spent some of my time working on a baby quilt for new neighbors. My husband and I were thrilled when they bought a house on our street and we’re doubly happy that they are expecting. While I was at the MAQF last week, I searched for a kit (I have very limited time and kits are okay) for a baby quilt. 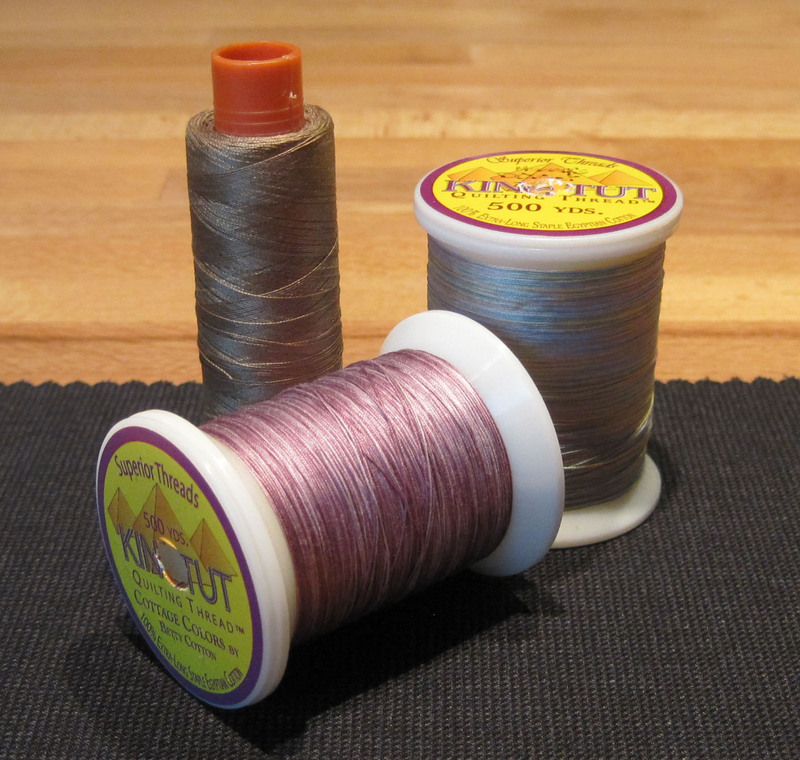 There were lots of kits, but nothing that made my heart sing — until I visited my friend Bruce, owner of Sew Batiks. 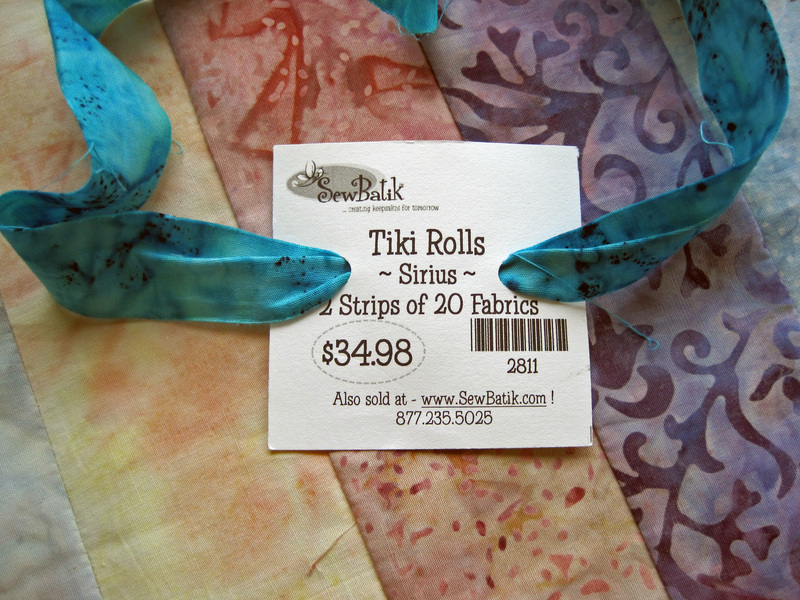 His Tiki Rolls made the perfect kit for a baby quilt top — (2) 2″ strips of 20 different (and lovely) batiks that only Sew Batik carries. 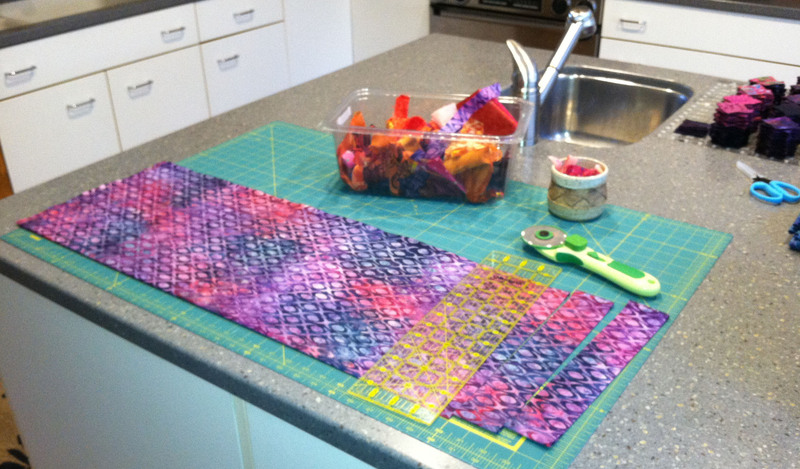 I laid out the pre-cut strips, sticking very close to the order in which there were packaged. So pretty! I often tell my classes to let the fabric do the work. In this case, I thought that was good advice — and the fabric is soooo pretty. Did I mention that I had the best possible sewing space? I had an unobstructed view of the ocean, which proved quite distracting. 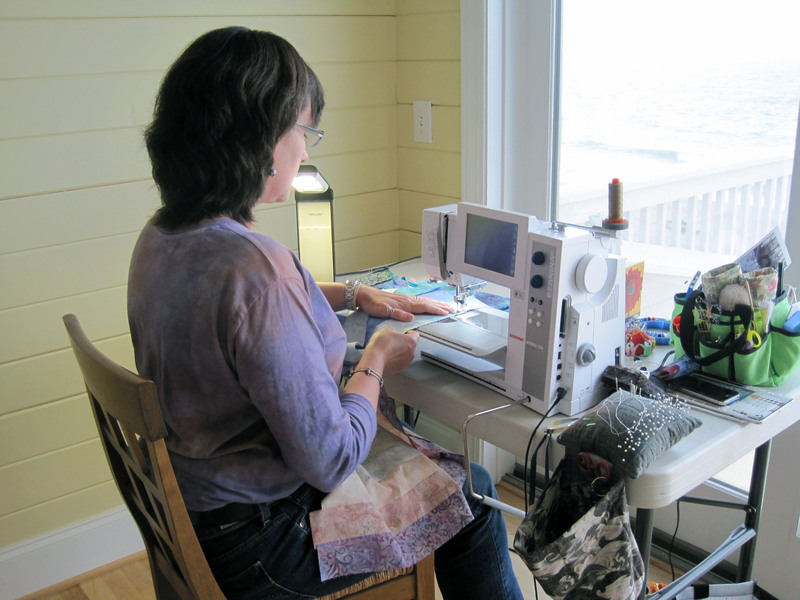 Sew, admire the pelicans, sew, look for dolphins, sew, take a break. Sigh. It’s a wonder I got anything done at all! Can you see the ocean through the window? 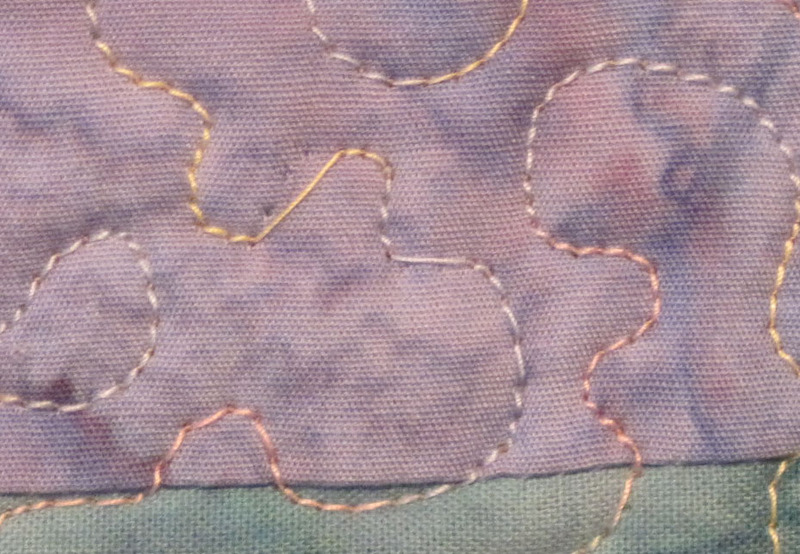 I’d like to think that as I pieced the quilt, I infused the peace of this place into each seam. I’d like to think that Bruce’s generosity, his calm demeanor, and his positive nature are woven into his fabric. I’d like to think that the baby who receives this quilt feels the powerful influences and love that went into this quilt top. I love this place and I love the time I get to spend here. I am fortunate. 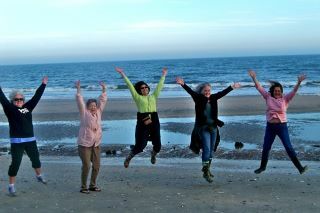 Left to right: Kathy Lincoln, Sue Reich, me, Mary Kerr, and Shannon Shirley. Picture by Darla Pittman. I cannot overstate how important it is to get out of Dodge every once in a while. Sometimes you just need a change of venue to spark your productivity and clear your creative palette. It’s been a long year, filled with rough patches and happy surprises. The fact that I’m able to be here, sharing a friend’s hospitality, is a tribute to the power of positive energy. The house where I’m staying is roomy and has been filled with an ever-changing cast of friends and family for the last week. The trip has been on my calendar for a good six months and I’ve looked forward to it each time deadlines loomed and things looked dark. Getting away doesn’t make everything magically better, but it does allow perspectives to shift and energies to be realigned. Take productivity for example. Every year I spend some time with friends at the Mid-Atlantic Quilt Festival. For the past two years, this small group has done a block exchange. I’ve had a really hard time getting around to those blocks this year, despite the fact that I really want the quilt that will result. 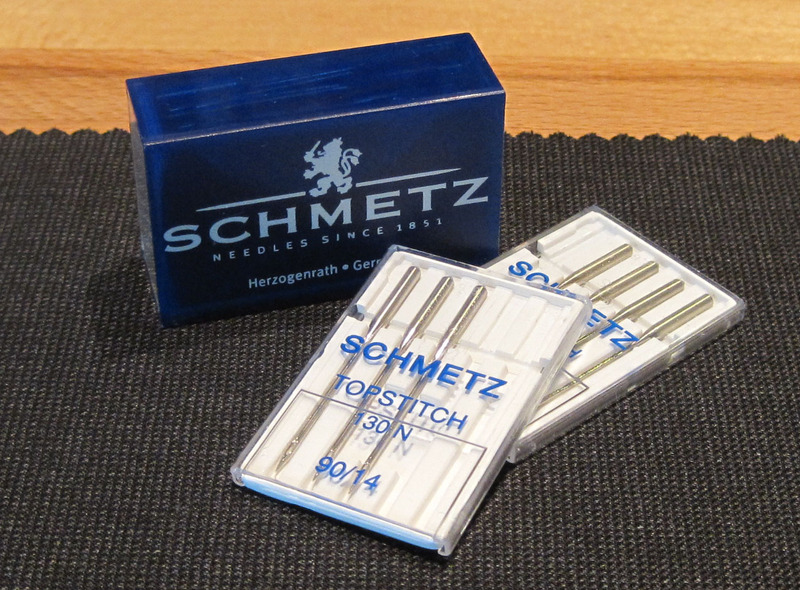 And so, I packed the fabrics, the pattern, and the tools, and I planned to work on them here. 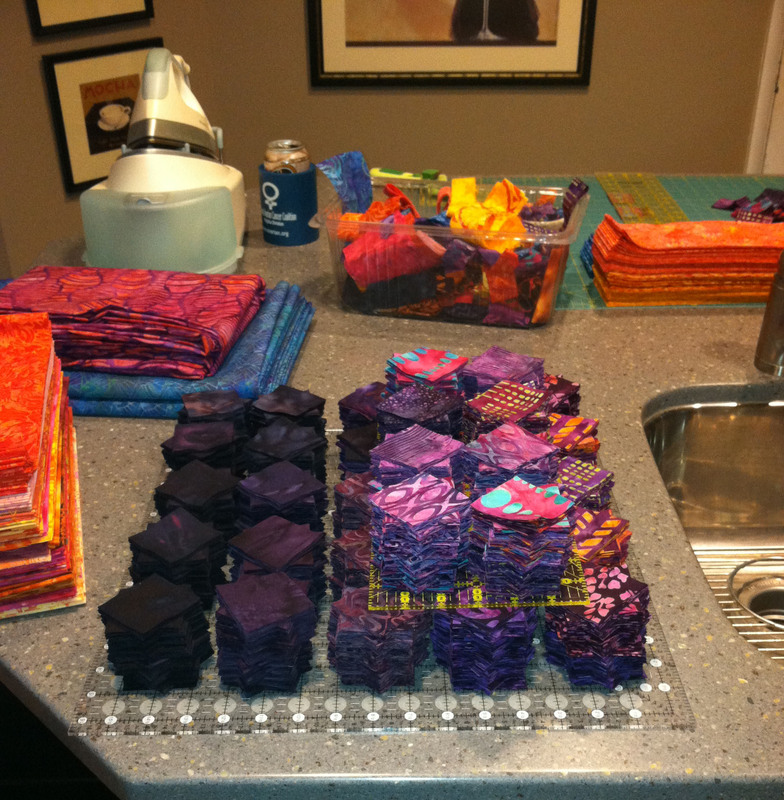 Here’s a shot of all 75 blocks, cut and ready to stitch together. The pattern is from Alex Anderson Classics and is called Holiday Lights. 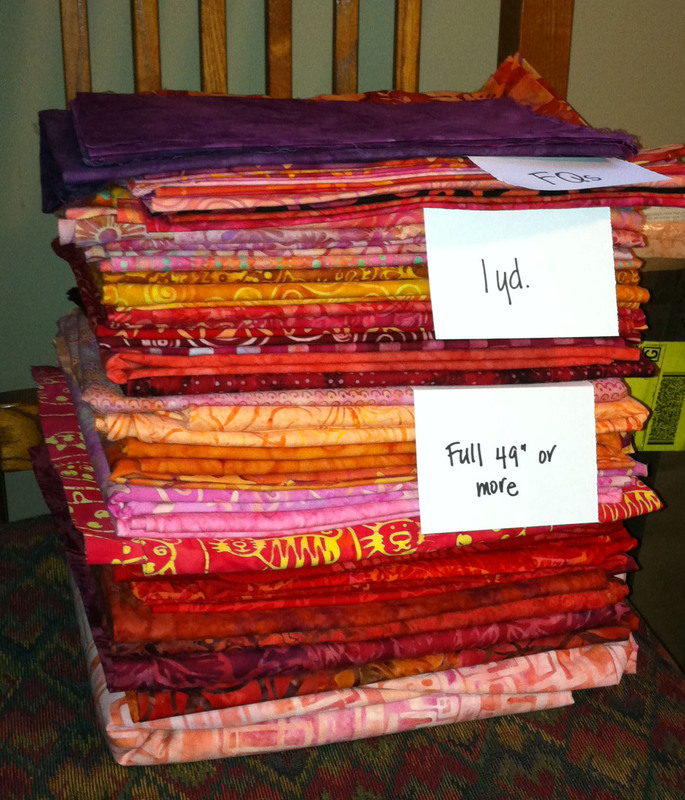 All 75 blocks are now sewn and ready for the exchange! I used this long pillow as a small makeshift design wall. How cute are these trees?! Now I think I have to make a pillow to go with the quilt. My friend Kathy has been feverishly working on billions and billions (okay, 472) flying geese units for a class she’ll offer at the Quilt Patch during the next session. This shot of the blocks was taken by Mary’s daughter, Katherine McPherson. Check out her work at www.katherinemcphersonphotography.com. Mary has been working on surprises and I can’t include any pictures here. I’d hate to let the cats out of the bag! Away from the day-to-day, usual routines, I find that I can breathe a little easier. I can relax a little and put things in perspective. In fact, I just delegated dinner salad duties to Jeannie, another quilter staying here. Those of you who know me will know how out of character it is for me to give away jobs and responsibilities. Now I’m going to go do the prep work for tonight’s dinner of smoked salmon piccata with fettucini. Wouldn’t it be wonderful if we could combine the activities we love and then spend time sharing them with friends? I’m a big fan of tea. No, not drowning a teabag in a mug of hot water; I mean tea in a china cup with delicate munchies and wonderful friends with whom to share it all. I’m also a big fan of special clothes. I love clothes, but I have a hard time finding things that I think look good on me while being appropriate. I think Stacy and Clinton (You know who I mean!) would have a field day in my closet. When my friend Judy Gula of Artistic Artifacts started talking about offering clothing patterns in her shop, I was very interested. I started sewing a very, very, very long time ago by making a pink short sleeved dress with a stand up collar embellished with a floral ribbon. Honestly! 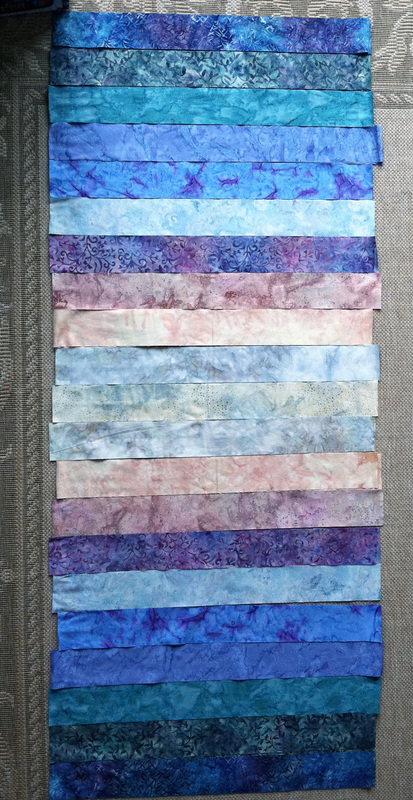 I continued to sew until I realized that I liked quiltmaking more. Flat is easier to sew, believe me. 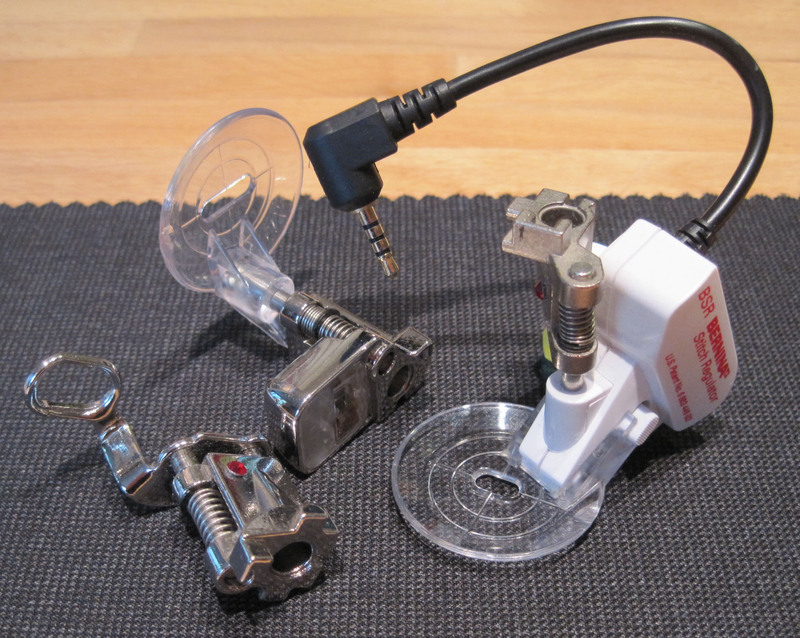 Now I think it’s time to revisit that decision and try to find time to make some of my own pieces. Judy rolled out her new program, which she calls Artistic Couture, a little while ago with a tea and pattern party. Many of us made garments for the occasion and I managed to create a top. The pants and jacket are off the rack, and the top represents more un-sewing than I’ve done on one project for a long time. The pattern is the Mimosa Top from The Sewing Workshop Collection. It’s sleeveless and comfortable. It should have been really easy to make, but I’m clearly out of practice. Okay, details. The fabric is a lightweight rayon from Britex in San Francisco, purchased ages ago. Great drape, nice hand. The band that forms the neckline is made from ombre silk (brown to black), pintucked and topstitched — and bought that way from Bohemian Elements last year at the Houston show. The silk wasn’t wide enough, of course, so I had to figure out how to piece it while maintaining the little rows of tucks. Sigh. More ripping commenced. I added length to the front and back and will probably sew the fronts together (eliminating potential gaps and slippage) before I wear it again. All in all, I like it and I’ll use it. And I’ll probably go on to make something else. It was fun. And, yes, I know that’s the face my grandmother warned against making, lest it freeze that way. Sorry, Nana! Don’t you love it when good things actually happen for good people? When the lottery winner seems nice or when the the person who wins the door prize seems genuinely happy? Well, I am thrilled to share this with you! My friend and colleague, Kathy Lincoln, has a quilt featured in the new issue (February/March) of Quilters Newsletter! Her quilt, In My Shade Garden, is featured, along with directions. And they’ve included a detail shot on their Table of Contents page! Too cool! If you’re a subscriber, you have probably already received your copy. If not, you’ll need to wait until the Dec/Jan issue of Quilter’s Newsletter comes off the newsstands and is replaced with this one. 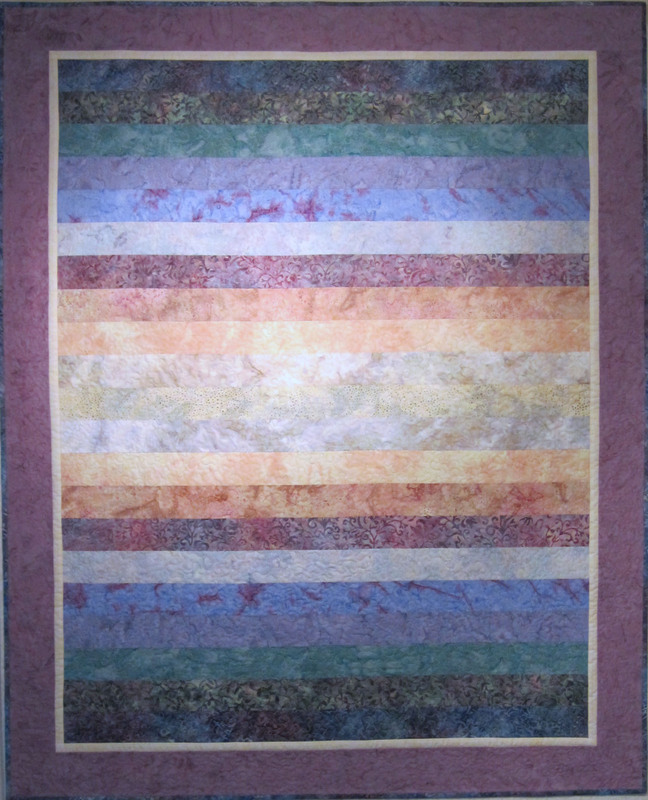 Kathy offers a workshop that features this quilt and includes timesaving tips and tricks. Check out her website: www.KathyLincoln.com. Good stuff, good people. It’s all good. I keep saying that I don’t do vintage, but I just finished my (very late) fifth entry in Mary Kerr’s Vintage Revisited challenge. 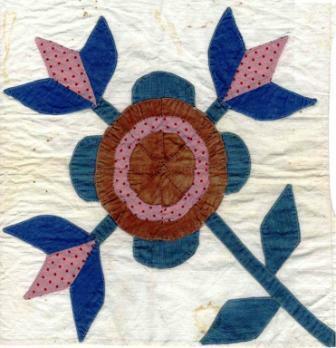 Mary is a talented quilt appraiser and artist who specializes in vintage materials. 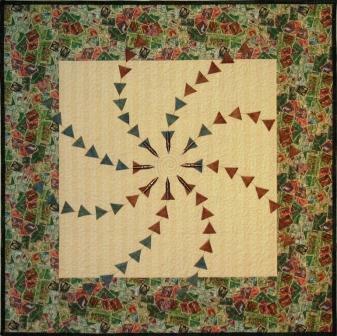 For this challenge, she gathered a group of 19 quilters who were willing to work with vintage blocks on and off for two years. I didn’t do this for the vintage; I agreed to participate because I didn’t want to miss out on the fun. You can do anything you want to the fabric: paint, dye, stamp (I love to stamp! ), whatever. The finished piece must be 24 inches square. The subject matter of your piece is up to you; it doesn’t need to relate to anything vintage. And so what do you do with this? Okay, I know that some of you might actually like this poor, faded, malpieced block, but once you get past feeling sorry for it, what do you do? The first thing I always do is free the fabric from the block. That’s right, I rip the pieces apart and assess the fabric I have to work with. 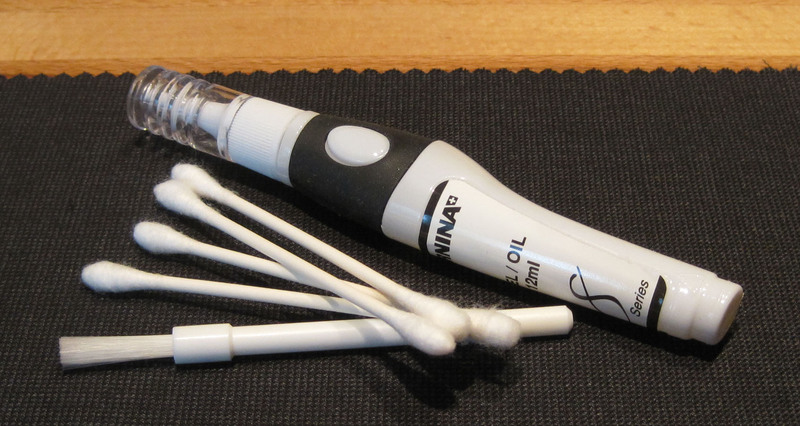 In this case, the fabric was weak and faded. Okay, I guess I would be too, if I were this old! Once I have just fabric, I can begin to look for a vision. I fill my head with as many ideas as I can about fabrics that coordinate, bits and pieces I can add for embellishment, and techniques that might work well. The fabric was weak, and so I knew I needed to fuse it to give it added strength. The fabric was unevenly faded, and so I stamped it to make it appear more consistent. And now for a vision. Well, this vision didn’t come as quickly as I had hoped. When the time came to give Mary a title, I had nothing. 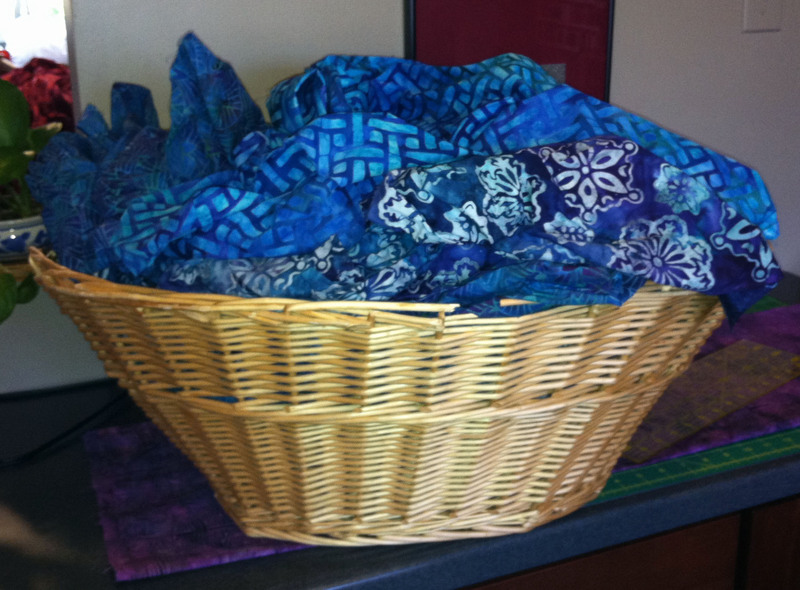 I felt like my ideas were all dead ends — going nowhere — and so I named the formless quilt: Circling the Drain. Now I was locked into using that image somehow. Then Mary called for artist’s statements. Still no quilt. And so I wrote a statement that I hoped would be general enough to work with whatever I wound up making but specific enough to be worth reading. You be the judge when you see these quilts in person. Some of the other quilts I made for this challenge dealt with letters and writing, and so I pulled out some commercial cotton with postage stamps on it and some pen nibs that Judy Gula of ArtisticArtifacts.com found for me. The rest is just what happens when you block out enough time in your studio and put some great music on your iPod. So where’s the fabric from the original block? I took the brown, the blue, and the pink polka dot, added fusible to the back, stamped it all with travel-related images in black ink, and fused it all down. I added the pen nibs to the center. I have a killer idea for the final block. My concern now is whether my skills can make what my brain can imagine. Stay tuned. I’ll blog this block in progress. Read more about Vintage Revisited, including the exhibit’s travel schedule, on Mary’s website: www.MaryWKerr.com. See the other treasures Judy Gula stocks on: www.ArtisticArtifacts.com. If you are local to northern Virginia, check out her bricks-and-mortar store in Alexandria. Thanks to Kathy Lincoln (www.KathyLincoln.com) for providing the picture of the block intact. I ripped mine apart too quickly for a photo.